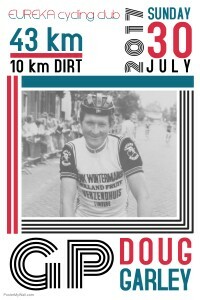 A new name will be etched onto the cobblestone trophy after Kevin Lee rode away to an emphatic win in the GP Doug Garley. On a day which was not wintry at all, with a hard packed dirt road which barely challenged, the only concessions to the “hard rider’s race” was the stiff north west breeze and two crashes that marred the race. Lee is one of the few who have ridden every race this winter and it was only a matter of time before he would be at the pointy end of a race. To claim one of the club’s feature races was not only testament to Lee’s dedication, it also gave him an opportunity to showcase his brand new steed and Kevin was mightily chuffed post race. Terry Collie and Brian Lee were first away – off Limit – at 17 minutes. Terry has few miles in his legs, but as Pete Livitsanis put it so eloquently at the post race presentations ‘Terry froths at the mouth at the thought of racing on dirt’. Brian Lee is on the slow road back and he took a big step out today as he gradually nurses himself back to full race fitness. Only there until the going got tough, Lee eased out of the contest once Collie was caught and cruised to the finish. The 12 minute group saw Roger McMillan and eventual race winner – Kevin Lee – welcome James Knipe and Dan Crook into their fold. Crook is new to racing with Eureka and Knipe was getting a push out as he also returned to race fitness. The group planned to work together on the testing circuit, knowing that a bunch which fought together stood the best chance of surviving. The largest group of the day rode off at 6 minutes. Peter Livitsanis was the stand-in handicapper for the day and he was joined by Dan Whelan, Jeremy Humber, Brian Ure and James Gretton. This mark would require a big effort by Ure and Gretton. 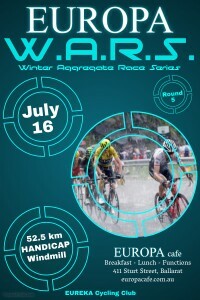 The stronger riders would need to manage the group well to stay clear of the rampant chasers. Unfortunately the climbing on the circuit and the headwind up Davenport Road saw Gretton dispatched from the group. Three strong riders in Second Scratch with Rick Calvert and Jim Crumpler joined by the returning Grant Dawson. With just two minutes over the Scratch group, the trio would push hard to stave off the “catch”, the challenge in doing so, would be not to tear each other apart. All was going well early in the race – they had stayed clear of Scratch for 15 kilometres and already caught one dropped rider (Gretton), then the turn into Hendersons Road a disaster unfolded. Calvert crashed on the corner and the group quickly pulled up to check on their comrade. In an act of selflessness, Calvert dragged his freshly skinned body off the tarmac, raised an arm and waved his men on shouting ‘You go forth oh mighty warriors’. Jason Birch welcomed Dean Wells back into Scratch on this day. Wells had a plan to catch Second Scratch inside the first lap, however he neglected to tell Birch. Away quick, they took almost 30 seconds out of Second Scratch before the turn into Avenue Road. Things went pear shaped however, when Birch flatted not long after entering the first dirt secteur and just 12 kilometres into the race. Wells settled into time trial mode and resigned himself to a long fruitless chase. Marking the positions of the Second Scratch riders, Wells soon accepted that the gap was opening back out, then a glimmer of hope as he realised something had gone amiss. Turning into Hendersons Road, there is Calvert trying to get his bike operational and just ahead are Crumpler and Dawson. Burying himself, Wells makes the catch before the pig farm and soon after starts swapping turns with Crumpler and Dawson. Gretton eventually discarded with the relentless pace. Out in front, Collie and Brian Lee are swapping turns and looking after each other. They catch the odd glimpse of riders behind them, but at the halfway point things are going well. 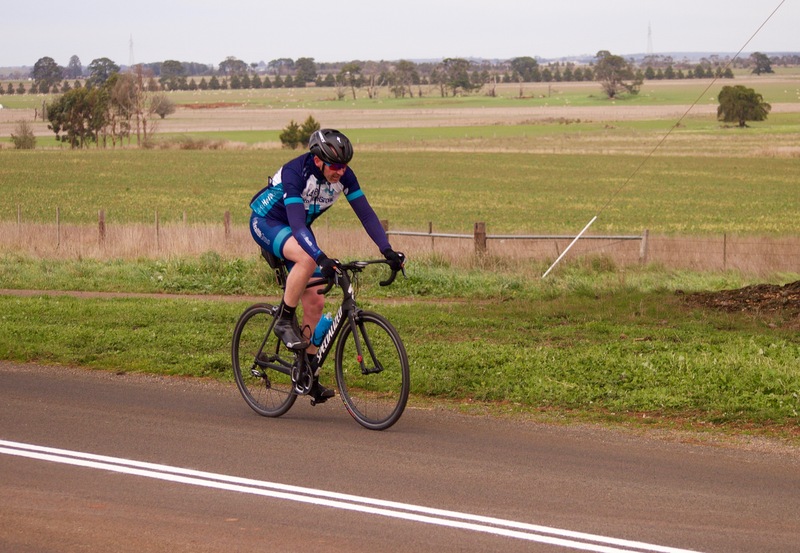 James Knipe is leading the way with the 12 minute group and their progression is going well as they tick off the kilometres and steadily close the gap to the Limit riders. Events take a turn for the worse when the bunch turns at the pig farm and Roger McMillan slips and crashes. Dusting himself off, McMillan is quickly underway again and he would go on to finish the race. Up ahead and Collie is about to complete the second of four dirt secteurs. Turning off Davenport Road Collie hears the marshal call out ‘They’re 400 metres behind’. 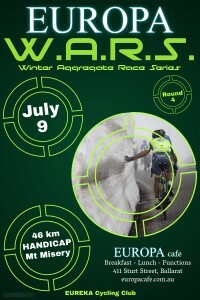 Initially disappointed, he soon remembers that it really is four riders chasing one. Brian Lee soon eases out of the race to let Collie fight his own battle. Knipe, Kevin Lee and Dan Crook are closing rapidly now. 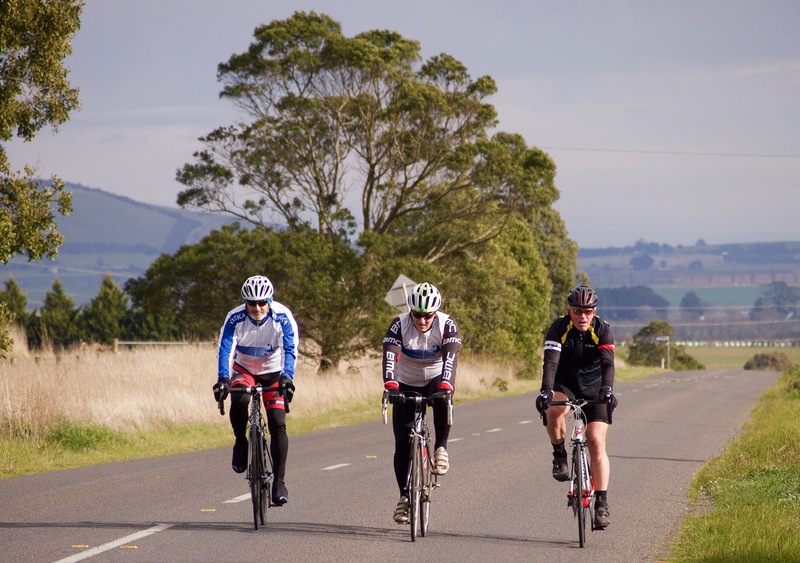 They make the catch with 15 kilometres remaining, aided by the tail wind along Hendersons Road. The next time they pass by the finish line they receive the bell. The 6 minute group are having one of those days. Everyone seems to be having a flyer and they are only gradually making inroads on those ahead. All the while, they can see the chase group gaining on them. Maybe not fast enough though, they receive the bell and have at least two minutes of their advantage remaining. Crumpler, Dawson and Wells have been working well together. Each playing to his strength – Crumpler and Dawson with the tail and head winds, Wells with the cross winds and the climbs. Turning out of Davenport Road for the final time, they mark the gap to the 6 minute group at ninety seconds. Wells starts to ramp the pace up and Dawson is dropped. Into Hendersons Road and Crumpler takes the lead to the pig farm. The race winner is coming from the bunch of four out front. They have a big enough margin over the chase groups at the turn into Davenport Road where Kevin Lee takes off. He opens a small margin and Collie waits for Knipe to close the gap before realising that Knipe is playing the gentleman and won’t take advantage of his “push out”. Collie takes off in pursuit. Crook is left wondering just what the blazes happened. From working together, the bunch has disintegrated and he is tailed off. The six minute group are still trying to work together, however the wind has buffeted the smaller riders to no end. Group cohesion is going out the window as they try and rotate turns. 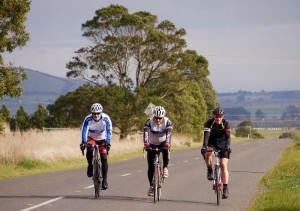 The stronger riders spending longer on the front and it almost just a matter of survival. Wells and Crumpler are closing the gap fast and by the turn onto Davenport Road they are just 20 seconds behind. The race leaders can be seen off in the distance, but there could be a place prize still up for grabs. Crumpler rolls through ‘I’m no use on the hill, but I’ll get you close’ he shots out. He plies the pressure on and almost closes the gap, a flick of the elbow – Jim is done for the day! Wells takes off in pursuit. Lee is pushing with every sinew as he forces his Scott Foil up the rise and through the headwind. He is clear and he is making sure no-one is stealing this hard fought victory. Lee takes the chequered flag and has over 100 metres on Collie who takes second in a brave effort. Knipe is just behind in third place and Crook battles his way into fourth place. Wells has latched onto the 6 minute group, he takes a few deep breaths then accelerates away in the small chain ring. He claims fifth place and Fastest Time less than one minute after the winner crossed the line. The line of warriors continued, trailed in by Roger McMillan. Many thanks to everyone who came out and braved the GP Doug Garley, although it must be said that the conditions were quite acceptable for winter bike racing. Damien Kierl was at the start line and kept a keen eye on proceedings. Kierl claimed 5th and Fastest Time in 2016, which Wells was pleased to emulate this year. Post race it was noted that Lindsay Burgoyne was not present. Lindsay had remarked that there were “no matches” at the post race feast the previous week. Lyn Rock duly made a batch of matches…which Lindsay missed out on! Rick Calvert and Roger McMillan compared gravel rash post race, with both riders sporting matching injuries to their left sides -shoulder, elbow, hip and knee. Near perfect winter racing weather for round 6 of the 2017 EUROPA Cafe W.A.R.S. 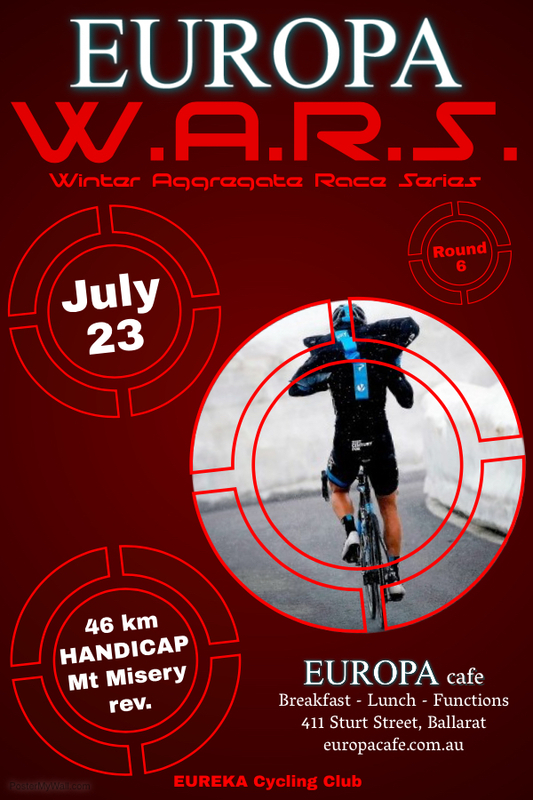 The 46 kilometre handicap on the Mt Misery reverse circuit was all important for earning Winter Aggregate Race Series points and a hardy contingent of riders arrived at the club rooms ready to ride their hardest. With many riders unavailable due to winter holidays, the Handicapper was faced with an even more difficult task achieving balance. Small numbers and small groups had most riders smiling in anticipation of a good showing. 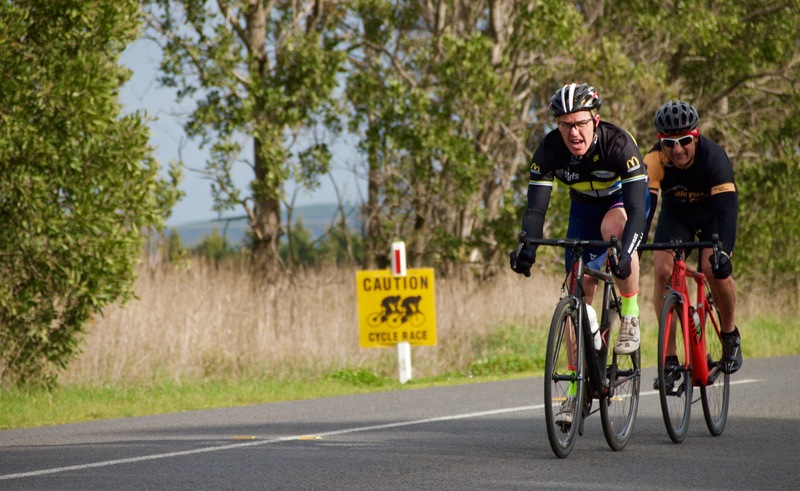 Graeme Parker was the lone Limit rider (24 minutes) and once again put in a brave showing. We would be singing Graeme’s praises, but for a dicky knee which wreaked havoc halfway around the circuit causing him to almost halt progress. The ensuing battle of man against tibiofemoral joint was ultimately won by Parker and he again forged ahead. Roger McMillan and Kevin Lee were away at 16 minutes. With a handy seven minutes on the chase group they expected to feature in the finish. Nature would have her say though as they raced along the back section of the circuit – Black Bottom Road. The dark clouds which had been boiling on the horizon, suddenly leapt overhead and brought not only a brief shower, but stronger gusty winds. Things suddenly got a lot harder for our dynamic. Would the stutter in cadence be their undoing? The 9 minute trio of Dan Whelan, Mark O’Callaghan and Bob Morley set off at a handy clip. Having just four minutes to spare over the strong chase group, Group Morley’s race was all about limiting the damage early and being well placed when the inevitable catch was made. With Whelan driving the pace – because that’s what Danny does best – the intrepid trio powered into the headwinds with gay abandon. Race favourites were the strong grouping at 5 minutes. Rick Calvert keeps surprising himself with his good winter form. Keeping Rick company was Paul Pickersgill and the ever improving Jeremy Humber. Off at a fast pace, the three rotated well and gradually closed the gap to the group ahead. With three minutes to spare over the next group, Calvert & Co. made sure they had just enough in reserve in case they were caught. Second Scratch received a huge advantage today – a whole 2 minutes over the lone Scratch rider. Brendan Schiemer and Dean Wells welcomed Lindsay Burgoyne back into their ranks today. Lindsay is deep in his training campaign for an upcoming overseas race. Keen to get some good racing under his belt, Burgoyne was clear with his message to Wells – ‘Don’t blow the bunch up on the first hill!’ With the instructions issued, the group took off and quickly settled into rotations that suited their strengths. 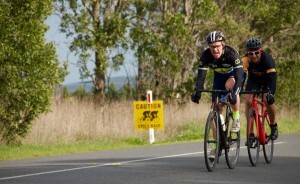 Tim Canny rode off with a plan – make the catch before the tailwind. One man against everyone else is tough, but Canny wasn’t fazed as he set about his individual time trial. One man, a power meter and a heart rate monitor. With the Second Scratch group always in sight, Canny would try to do this by the numbers. On this day the task was one step too far and although he cut the margin to less than one minute, once the Burgoyne bunch turned onto Waubra Road they quickly blew the margin out again. The Burgoyne bunch had Calvert & Co. and Group Morley in sight as they raced up the Mt Misery climb. Wells drove them over the crest and pushed on until the catch was made. Suddenly a nine man bunch had formed – some working and some hanging on for dear life. Down to Addington and Pickersgill led the bunch through the turn. Schiemer then surged right through the group and pushed the pace as the next climb started. The catch on Lee and McMillan came so quick that the duo had no idea they were about to be swamped. Burgoyne assumed the lead and with the aid of the tail wind he kept driving the bunch harder and harder. Parker could be seen in the distance. His red jersey a beacon of hope to the chasers. Elastic bands started to stretch as Burgoyne pressed on. Just before reaching the top of the final climb those bands broke and there were just four riders chasing Parker. Burgoyne, Wells and Calvert kept the pace high under the urgings of Schiemer. Parker was caught just a few hundred metres short of the sharp left turn back onto Weatherboard Learmonth Road. Burgoyne’s pace was hot into the corner, too hot and he overshot the tarmac. This disrupted Schiemer’s line and he went wider than he wanted. Like Moses parting the Red Sea an opportunity presented itself and Wells surged through the gap. Schiemer recovered and put in an all out sprint to regain Wells’ wheel. They were clear of Burgoyne – who had stayed upright after practicing for next weeks GP Doug Garley – with Calvert joining him in the chase. Wells and Schiemer pressed ahead. Nearing the line and Schiemer rotated through – spent and cramping – before Wells accelerated away for the win. Burgoyne claiming third and completing the trifecta for the Second Scratch group. Parker rolling in fifth after showing his knee who the boss was. 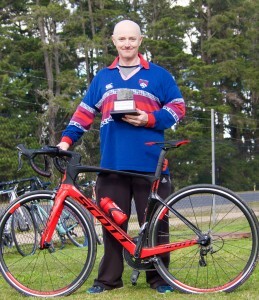 Kudos to Tim Canny for claiming Fastest Time by 17 seconds. 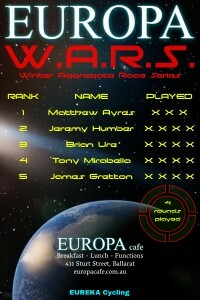 Round 5 of the Europa Cafe W.A.R.S. certainly delivered in spades as nineteen brave souls battled the near freezing elements out on course. The riders were once again reminded of how Blowhard got its name as they raced three laps of the Windmill circuit. 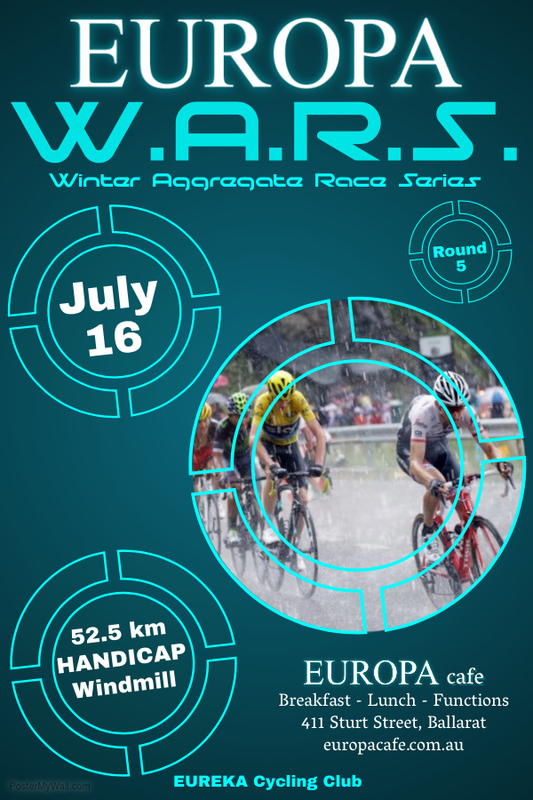 With the feels like temperature hovering around minus 3 for the entire race, the warriors certainly felt every minute they were out on their bikes. As expected in these conditions, the strongmen came to the fore and led their individual groups towards the glorious finish line (and the promise of warm club rooms and a hearty spread). Graeme Parker was once again the sole Limit rider (at 30 minutes). In his seventies and with a dicky knee, Graeme powered on through the wind and was only caught six kilometres from the line. Another sterling effort by Graeme! The 17 minute group were under the pump from the get-go. With James Knipe struggling from the start, the seven minutes advantage over the following bunch never seemed enough for Kevin Lee, Steve Linane and Brian Lee. Knipe made it through two laps before retiring. 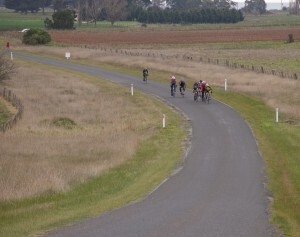 The remaining trio were swamped heading over quarry hill (Learmonth-Sulky Rd). Unable to latch onto the faster bunch, they consigned themselves to the long cold ride to the finish line. The largest group of the day set off at 10 minutes. Driven along by the strong Jim Crumpler, this bunch maintained most of its numbers until the final lap when they lost Dan Whelan. Mark O’Callaghan lost contact after the group was caught by Second Scratch. Pete Livitsanis, Bob Morley and newly promoted Brian Ure concentrated on not getting dropped from the large pack. 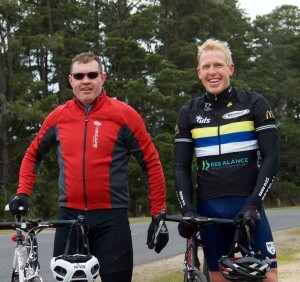 Whilst Jeremy Humber showed his strength by continuing to work turns with Crumpler and the remnants of Second Scratch. Both old and new faces in Second Scratch as Jason Birch got a move out to join riders, who last season often found themselves in the Scratch bunch. Eureka BT (Before Tim) was a long time ago though – nowadays, riders such as Matt Ayres, Pater Canny, Rick Calvert and the ever young Rob Phillips often find themselves quite a few minutes ahead of Scratch. Ayres resplendent on his fancy new steed found himself lamenting that maybe the motor doesn’t match the chassis at present. Along with Canny, he lost contact on the downwind section of the circuit. The pair chased in the hope that the entire field would have “mechanical incidents”. Even with only one functional lung, Birch led Phillips and Calvert a merry trot around Windmill, although it must be said that Phillips gave as good as he got! They hunted down the 10 minute group and together this band of eight set their sights on Graeme Parker out front. Claiming the race lead with six kilometres remaining, the next concern was whether or not they had enough of their advantage remaining over the Scratch riders. Phillips turned the screws after the bunch turned onto Donovans Road. Livitsanis, Ure and Morley were all left pedalling squares as the others shot up over the rise and raced towards imminent victory. The final selection had been made, with Calvert and Phillips finding themselves in elite sprinting company. Closing to the line and all five riders seemingly launched at the same time. Powerman Crumpler opened a small gap over Birch and held it to the line for his first win at Eureka. Phillips was close behind in third, ahead of Humber and Calvert. The Scratch duo of Tony Mirabella and Tim Canny had a whopping five minutes to make up on Second Scratch. 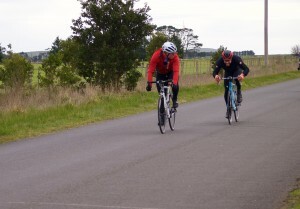 Once again they time trialled – however today they fell less than one minute short. Tim claimed Fastest Time after the pair fought out a short sprint finish. Braveheart Brian Wields His War Hammer! 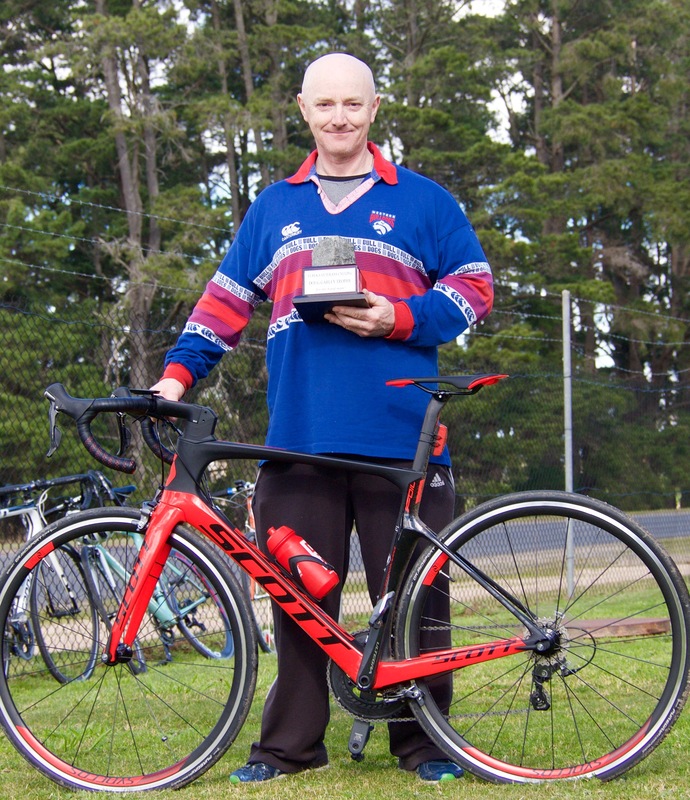 Brian Ure soloed to his maiden handicap victory with EUREKA Cycling after leaving his fellow Limit riders strewn around the circuit. 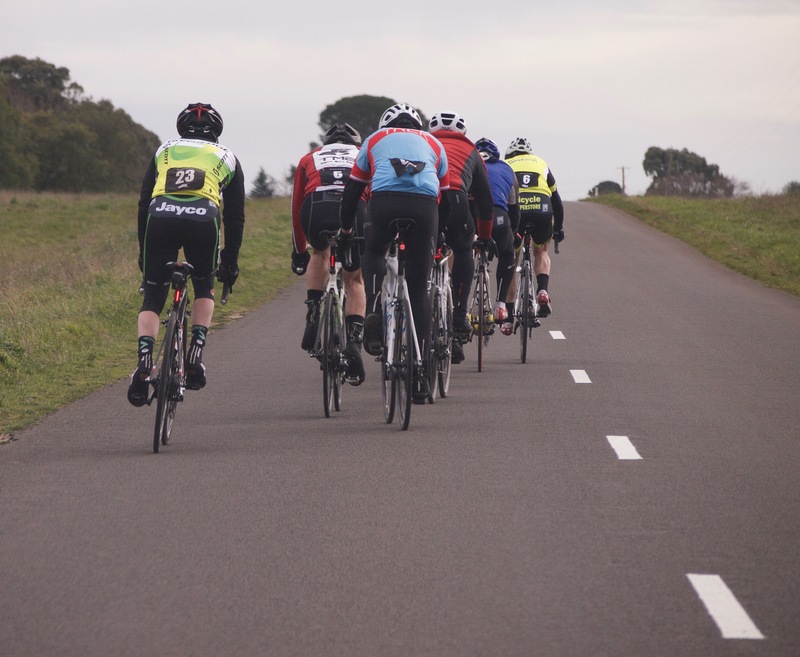 Five riders made up the Limit group (15:00 min) – Ure, Kevin Lee, Brian Lee, Steve Linane and Roger McMillan – unfortunately most were struggling early as they battled the block head wind in Edmonston Road. One by one the riders fell away until only Kevin Lee and Ure remained. Heading south along Black Bottom Road the pace (with the cross/tail wind) was too much for Lee. Freedom was Ure’s! He unleashed an almighty Gaelic scream “ghabháil dom más féidir leat tú bastards” – which loosely translates to “catch me if you can you other riders” – wielded his war hammer and strove away. 22 kilometres to go and 21 chasers…the odds were in Ure’s favour! The 9:00 minute group was the largest bunch and all six riders are race fit. Jeremy Humber and Peter Livitsanis were both out to earn more W.A.R.S. points and improve their rankings. Mark O’Callaghan, James Gretton and Dan Whelan provided the early driving power for the group and Bob Morley was anticipating the race would all come together after ascending Weatherboard. The hills on the first third of the circuit caused issues with some members of the group – laying a foundation of fatigue that would come back to bite hard at the tail of the race. The 5:30 minute group often find themselves off Second Scratch, however on this day they had been moved out two minutes. 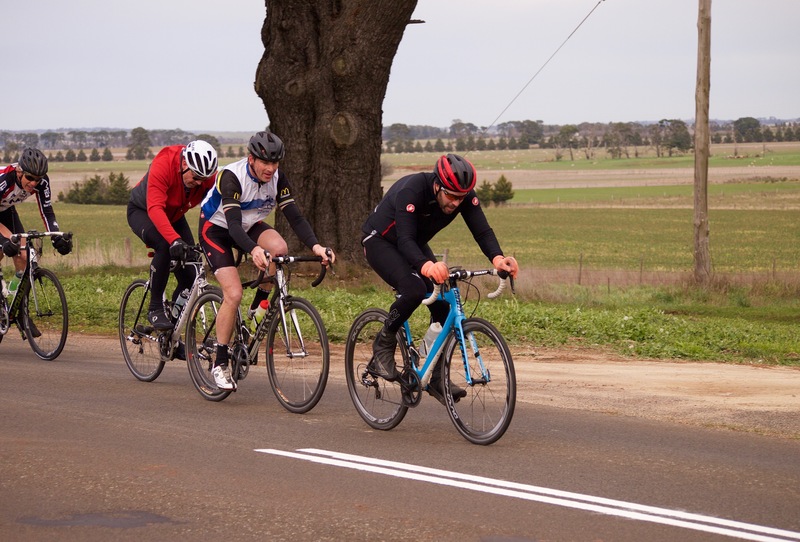 All four strong riders worked their turns – Rick Calvert, Peter Canny and Peter Kiel all ably assisting Rob Phillips who took longer and longer turns on the front with the tail wind. Second Scratch (3:30 mins) was decimated early after Stu Brien bowed out due to Veisalgia, quickly followed by a puncture to Paul Pickersgill. 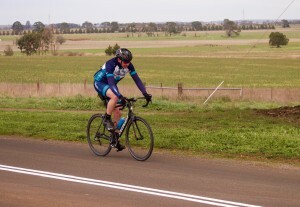 With 40 kilometres remaining, Dean Wells and Brendan Schiemer quickly settled into Time Trial mode to attempt to hold Scratch at bay. The pair had taken one minute out of the Calvert group before Addington, however the numerical advantage belonged to the riders up the road, so Wells and Schiemer managed their efforts. Scratch had an early casualty with Jason Birch dropping from the insane pace that Tony Mirabella and Tim Canny launched from the start line. Kudos to Jason for soloing to the end! Mirabella and Canny gradually closed the gap to Wells and Schiemer. Making the catch with 12 kilometres remaining, the quartet started taking distance out of the groups ahead. At the climb up to Weatherboard, Ure was still clear of the field. Most of the other out markers had been caught and dropped by the Calvert group which now also contained most of the Morley group. Mirabella put the race into the gutter. Tim Canny on his wheel and a long line of riders in single file followed. The cross wind did its work and the tail end riders started to lose wheels as Mirabella and Canny swapped turns in an effort to bridge the large gap to Ure who was now in sight. 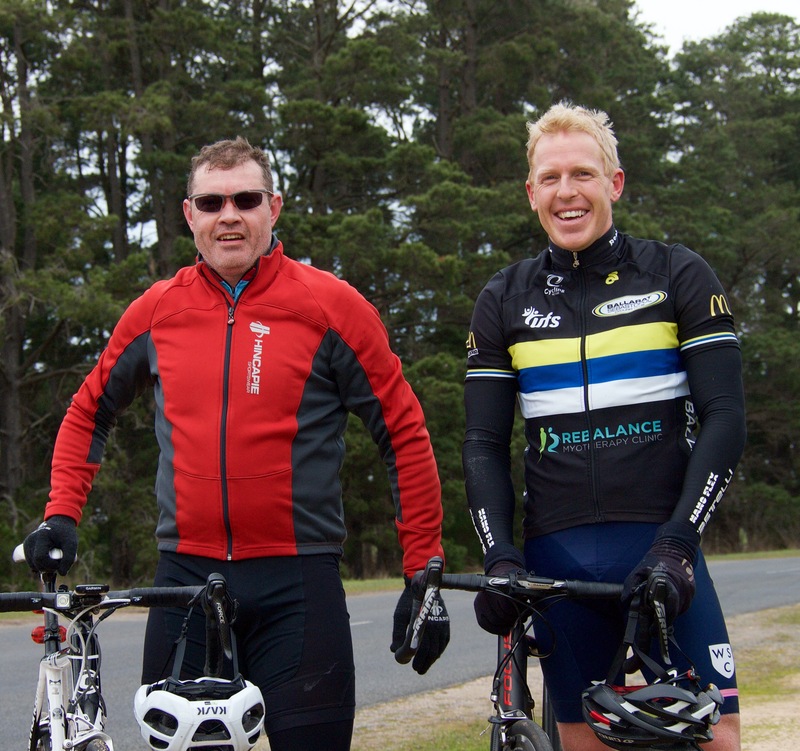 Out of the dip and Tim Canny drove the bunch, however Ure was clear and claimed his victory with 150 metres to spare. A bunch sprint for the minor placings was opened by Schiemer. Mirabella gave chase and claimed him for second place and fastest time. Canny rallied again to collect fourth place after a sprinting “incident” with his dad – Peter – who claimed fifth place. Kiel, Wells, Humber, Phillips, Livitsanis, Morley and Calvert all close behind.